Look who’s come to save Telstra! Photo by Wired Photostream on Flickr. A selection of 11 links for you. Really, they are. I’m @charlesarthur on Twitter. Observations and links welcome. For months leading up to the [November 2016 presidential] vote, Obama and his top aides quietly agonized over how to respond to Russia’s brazen intervention on behalf of the Donald Trump campaign without making matters worse. Weeks after Trump’s surprise victory, some of Obama’s aides looked back with regret and wished they had done more. …This account — based on interviews with more than a dozen people involved in the government’s investigation and Facebook’s response — provides the first detailed backstory of a 16-month journey in which the company came to terms with an unanticipated foreign attack on the U.S. political system and its search for tools to limit the damage. Steve Bannon plotted to plant a mole inside Facebook, according to emails sent days before the Breitbart boss took over Donald Trump’s campaign and obtained by BuzzFeed News. The email exchange with a conservative Washington operative reveals the importance that the giant tech platform — now reeling from its role in the 2016 election — held for one of the campaign’s central figures. And it also shows the lengths to which the brawling new American right is willing to go to keep tabs on and gain leverage over the Silicon Valley giants it used to help elect Trump — but whose executives it also sees as part of the globalist enemy. The idea to infiltrate Facebook came to Bannon from Chris Gacek, a former congressional staffer who is now an official at the Family Research Council, which lobbies against abortion and many LGBT rights. “This seems perfect for Breitbart to flood the zone with candidates of all stripe who will report back to you / Milo with INTEL about the job application process over at FB,” he continued. “Milo” is former Breitbart News Tech Editor Milo Yiannopoulos, to whom Bannon forwarded Gacek’s email the same day. “Can u get on this,” Bannon instructed his staffer. Seems to have come to naught. But shows that the culture wars in the US are deeply e,bedded. …All of the search results that you see in these different cases will come directly from the search API, which means you’ll be getting the raw, ranked search results that start below all of the ads and Knowledge Graph stuff that appears on a regular Google home page. Worth noting, of course, that once you’ve clicked on a YouTube video, you’re still going to get served ads, so there is a revenue driver here for Google, even if it’s not direct. Will Google ever push ads into those results? But it makes sense, as Panzarino notes, for the new version of Apple’s MacOS that’s just released. Microsoft is left with image search in Siri – not really a big source of demand. Sayonara, Bing. Hello, bigger TAC (traffic acquisition costs) for Google. As it turns out, unsigned apps on macOS High Sierra (and potentially earlier versions of macOS) can allegedly access the Keychain info and display plaintext usernames and passwords without a user’s master password. Security researcher and ex-NSA analyst Patrick Wardle tweeted about the vulnerability early this morning and shared a video of the exploit in action. But if it applies “potentially” on earlier versions.. what is the choice? Not much, apart from not running unsigned apps. Microsoft’s PC maker partners are readying some new low-end devices running Windows 10 S, which they may be marketing as suited for “frontline” service workers. New Windows 10 S devices are coming from Acer, HP, Lenovo and Fujitsu, starting at $275, and will be available later this year, Microsoft execs said today at the company’s Ignite IT Pro conference in Orlando. Microsoft and partners will be hawking these devices as “Microsoft 365-powered.” Microsoft 365 is a bundle of Windows 10, Office 365 and Microsoft’s enterprise mobility and security services. The plan is that these will be deployed in enterprises. Essentially, taking on Chromebooks. Telstra has lost about $12 billion in market value since Andy Penn stepped up as chief executive in May last year. So you can understand he’s looking to pull every lever he can to reverse the slide. A billion dollar bet on the Philippines? Sure, if there’s a taker. How about a flutter on whatever telco talent is currently floating about on the market? Other than Sol Trujillo, of course. So the telco giant announced on Wednesday that it has secured the services of former Nokia boss, Stephen Elop. And the telco industry’s man for all seasons, Kevin Russell, who has stints as Optus CEO, and Hutchison 3’s CEO, on his resume. By the end of 2017, Fossil Group will have launched more than 300 connected watch styles across 14 brands. The devices are now also active in 50 countries and 21 languages. “Today our wearables segment is the fastest-growing part of our business,” says Greg McKelvey, chief strategy and digital officer at Fossil Group. “Customer demand is strong and getting stronger, and we’re just on the front end of this business evolution. Clearly, this distinct combination of the best design and the best tech is winning with fashion-conscious consumers, especially our female customers who were long neglected by other wearables brands,” he adds. In the last 12 months, Fossil Group says it has doubled its points of distribution for its connected devices and more than doubled its sales of wearables. Instead of battling with technology giants that want a chunk of the wearables market, Fossil Group is working with them. Google continues to be a key strategic partner for the company, supporting the expansion of products powered by Android Wear 2.0. The key point here (as Benjamin Clymer pointed out) that whereas the watch companies have always been proud in the past of making their own internals, now they’re farming it out in this new segment – while Apple goes the opposite way. How’s that going to work out, long-term? We have been tracking the German election using social media since February, and 6.8 million tweets later we have some predictions. Our Data Analytics Engine (which had correctly predicted Brexit, the US Election and the latest British one against the polls’ opinions) is now predicting for Germany….well, pretty much what the German polls are saying – except for the AfD. Dataswarm’s prediction: CDU+CSU 34%; SPD 27%; AFD 16% (but variable from 12%-20%); FDP 7%; Linke 9%; Greens 7%. All +/-2% apart from AFD. Actual: CDU+CSU 33%; SPD 20.5%; AFD 12.6%; FDP 10.7%; Linke 9.2%; Greens 8.9%. Low bot activity (languages defeat English speakers, it seems). Will be interested to see what they think of this; the miss was pretty much all about the SPD. This isn’t a trivial read; but the conclusion is useful in thinking about what deep learning will and won’t do. the Watch is effectively stealing usage from the iPhone. At first it took alerts, timekeeping, and basic messaging away. Now it’s taking basic phone calls and music and maybe maps. The Watch was born a timepiece but it is traversing through the early iPhone and pulling in a new direction all of its own. The fact that we are talking about “Resting Rate”, “Arrhythmia” and “Atrial fibrillation” at a timekeeping launch event indicates that new behaviors will follow and so will the language we’ll use to describe this child-like product once it grows up. Notable how the link in “tentpole troika” goes back to a piece he wrote in 2014, with the introduction of the Watch, and its symmetry to how the iPhone has changed. I think there will be plenty of people who will miss the point of the Watch (and smartwatches) on the basis that “the screen’s really small – how can you work on that?” Remember, much the same used to be said of the iPhone. Rumors are spreading that Japan’s Fujitsu has decided to sell its subsidiary operating the mobile phone business. The bidding process may start next month. Fujitsu already categorized its mobile phone business as non-core and spun-off the division into a subsidiary in February 2016. Fujitsu has now decided to sell-off the entire handset business. In early 2000, there were about 11 Japanese companies involved in the handset sector, including Fujitsu. Japanese handset makers grew to almost 20% of the global handset market at its peak. The domestic market was dominated by these local brands. Japanese brands ruled the local market with more than 80% for a long time. Since 2009, however, Japanese makers began to struggle due to the rapid growth of Apple. Japanese makers slowly exited the global market and their share declined. This happened even in the Japanese market to around 30%. …Analysis of the handset market share in the Japanese market [now] clearly shows that the market is changing. 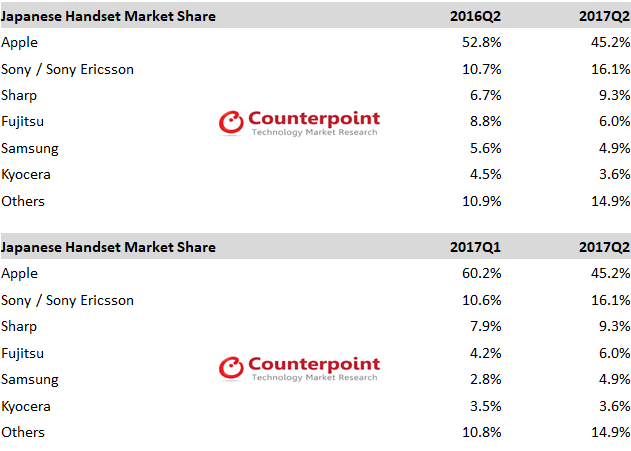 In 2016, Fujitsu’s market share in Japan was about 7%, ranking fourth, and Fujitsu’s main products were targeting the >$400 price band. Customers belonging to the >$400 price band will likely be absorbed by Apple, Sony and Samsung. I suspect the struggle since 2009 has been more to do with the rapid rise of Android than Apple. Though who can forget Wired’s fabulously wrong insight from February 2009 about “Why the Japanese hate the iPhone“? (Since updated with a note about, well, OK, some Japanese might like it, but not many. OK, quite a few. Oh, really, nearly half of all buyers? Web readers! You can sign up to receive each day’s Start Up post by email. You’ll need to click a confirmation link, so no spam. re “only install signed apps”: those are not inherently more secure, it’s just that Apple can de-sign them after they’re found to contain malware.